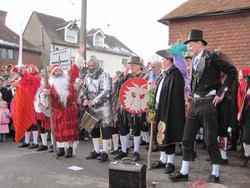 The present Ditchling Mummers were formed in 1986 and every year since then have performed a Sussex Mummers play at The Bull on Boxing Day. 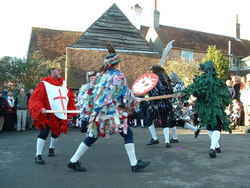 Documentary evidence shows Mummers performing in Sussex from the 17th century and although the tradition has been recorded in England from the late medieval period, it is likely to be much older. The plays are based on a resurrection theme each following the same basic format with characters such as St George (sometimes King George), the Turkish Knight, the Valiant Soldier and The Doctor. So far no evidence has been found of a traditional Ditchling play, although Amy Sawyer's Village Players are photographed as Mummers circa 1920.